Steve's fascination with sealife is evident in this carefully detailed hermit crab. Take one of these tidal-pool playmates from your childhood home with you! Shown here is the large gold crab. 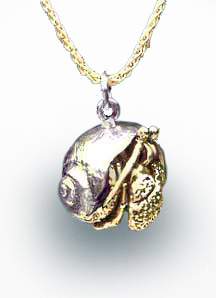 The special version has a 14k gold crab with an antiqued sterling shell, as depicted.